There are plenty of productivity apps out there to help people get more done. But at times, users can find that these apps mainly just help them organize and grow their to-do list, rather than cross things off. Now a new app from Eisenhower.me aims to put a new spin on the old concept, to actually help users complete important tasks and set reasonable deadlines for the rest. 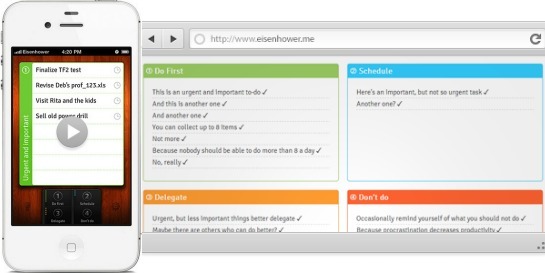 Using the Eisenhower Matrix time management principle, Eisenhower.me allows users to create new tasks and separate them by deadline and importance. If you’re unfamiliar with this method, users evaluate tasks based on whether they’re important or unimportant and urgent or not urgent, and then put tasks into different quadrants accordingly. So for example, an important project that’s due today would be put into the important/urgent quadrant, but an equally important project that is due the next week would go in the important/not urgent quadrant. Busy work and time wasters would go in the not important/not urgent quadrant, and thus would be either delegated or just crossed off the list altogether. Using the Eisenhower.me app, users can actually set a timer to accomplish those important/urgent tasks and set deadlines for the important tasks that are not quite as urgent. It also allows them to assign tasks to others when the task isn’t important or quite as urgent as other things on the to-do list. For businesses that need help prioritizing, staying on task, and even delegating, this type of app is supposed to help you actually manage and keep your to-do list in order, rather than just watch it grow. 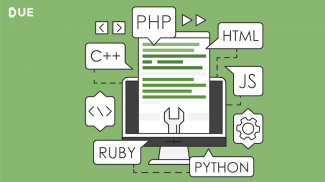 Though it’s not created specifically for businesses – owners, managers, and other professionals could definitely benefit from such an app. The Web app is free and has been available for use for some time. But the new iPhone app is designed to work in essentially the same way, and can even be synched with the Web app so that all your tasks match up. The mobile app costs $1.99 in the App Store. Thanks for informing me about this new productivity app! I have now downloaded the app and purchased one paper pad with the Eisenhower Matrix. I have a gut feeling that “the urgent-important matrix for time management fans” will fit well with my under construction productivity approach, F.I.X IT!